This opened in 1812 in the parish of Broadwater, specifically as a chapel for the new resort. It cost £12000 (Horsfield II p298), a large sum at the time, which was mostly raised by pew rents. The architect was J B Rebecca (Colvin 4th ed p846), who was much involved in the building of the resort, and it is in the style of its period. A ‘Mr Hide’ (Norman p6) (presumably E Hide) oversaw the completion of the interior, probably using Rebecca’s designs. 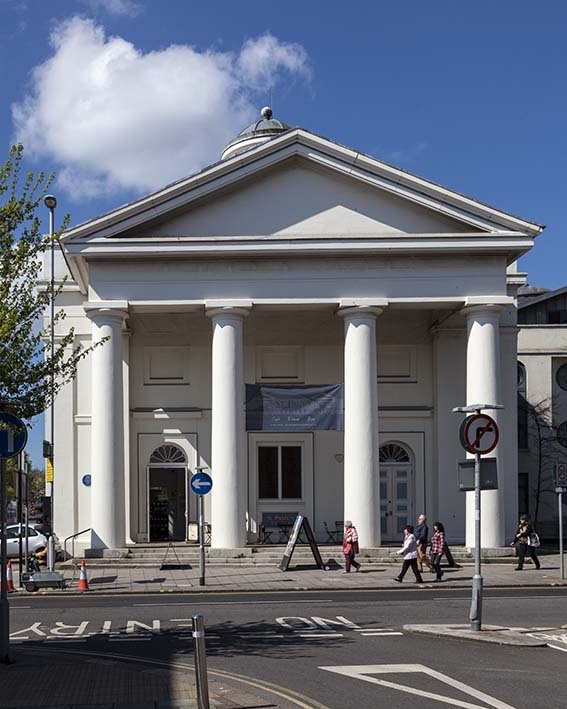 The chapel appears to have proved popular, for as early as 1819 the ICBS approved a grant for extending the seating and enlarging the gallery. The plan, which is signed by J P Henly, is wrongly identified as Christ Church, but the plan is unmistakably St Paul’s. Rebecca’s exterior has changed little. The portico at the east end has four Doric columns with a squat cupola above and both are stuccoed. The sides are of local brick and have two tiers of windows because of the galleries, which are balustraded on Tuscan columns; there was originally a west one also. Although the portico was always the entrance, the communion table was originally in the small space behind it, afterwards turned into a baptistery, but now devoid of its font. Below the organ was a conspicuous pulpit (cf St John, Chichester, where the arrangement is unchanged). There were proposals to alter the interior as early as 1884 (1 p6), which came to fruition in 1893 when a parish was established. Starting in 1891, R S Hyde (ICBS) turned the interior round and added a short western chancel, which has a coffered barrel-vaulted ceiling and walls covered in variegated marbles. Outside, there is no sign of the chancel and inside it is divided from the body of the church by a heavy arch with free-standing columns. Hyde (ibid) also designed a dark nave roof and remodelled the west (liturgically) end, turning the then entrance into the baptistery window. The later history of the church has not been easy. It is in the centre of town, so there were few resident parishioners and today not many holidaymakers attend church. When problems arose with Hyde’s roof in 1996 because of its weight, the church was closed and declared redundant. Subsequently it was taken over by a trust, with the object of turning it into a community centre, including a small chapel, and this was opened in 2010. 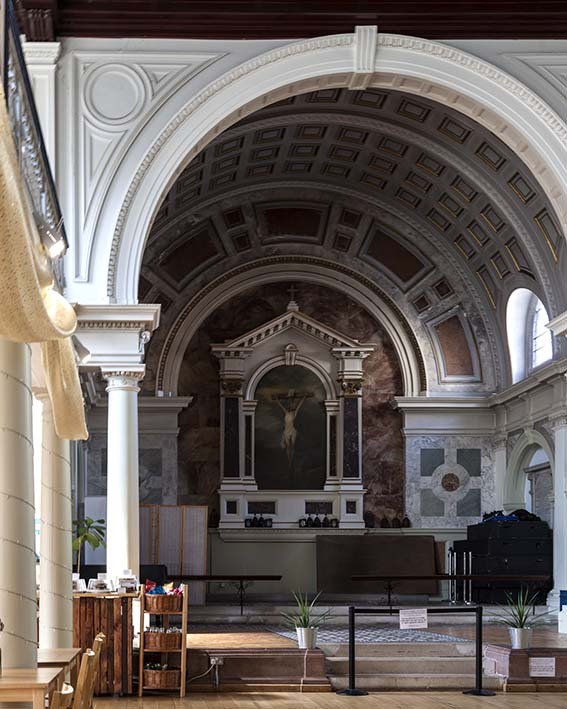 Work on adapting and repairing the church included a completely new roof and though cleared of its fittings, the interior has not been subdivided, allowing it to be used for concerts and the like. To the north of the church a block of sheltered accommodation has replaced the former hall. This is white like the church and has curious round porthole-like windows in the main front. The architect of the whole project is C Robinson (Project website). Font: Octagonal. This is no longer there and may have been C15. It is said to have come in 1894 from Chichester cathedral (CDK 1894 pt 2 p143). 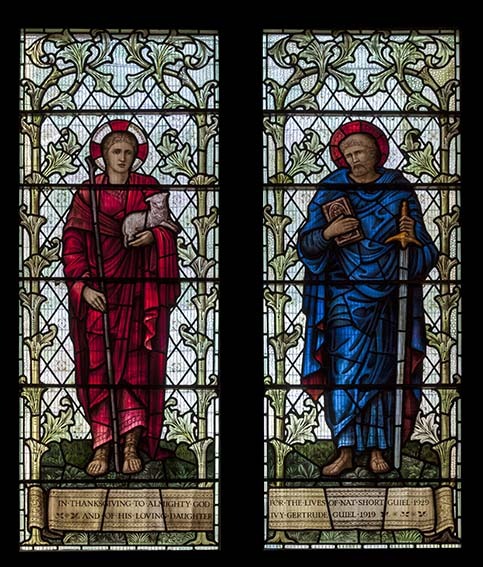 Glass: (At eastern (liturgical west) end) Morris and Co, 1933 (Sewter p209). 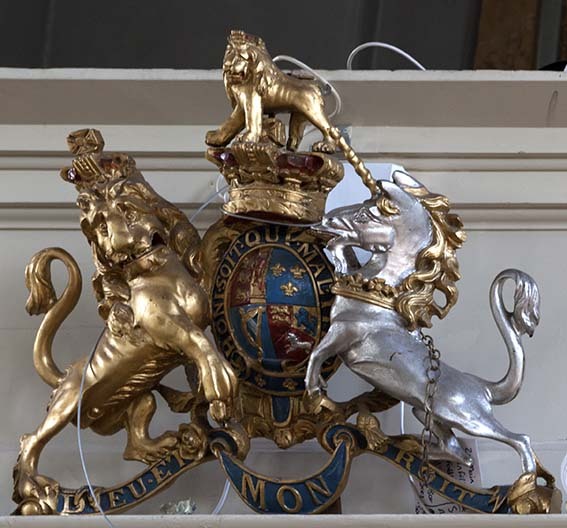 Royal Arms: (Gallery front) George III before 1802. As the church was not opened until 1812, this cannot have always have been here. Nick Wiseman suggests it may have been intended originally for St Mary Broadwater, where there is today a later Arms of the post 1816 period. (personal communication).